Jama is now completing the first unit of an order of 3 Rock breakers to LKAB in Kiruna. The machine is operated from a control room above ground and has a weight over 40 tonnes. 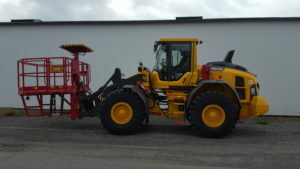 It is equipped with a 4-tonne hydraulic breaker that breaks the rocks that are too big to pass the grizzly with openings of 0.5 * 0.5 m.
We at Jama are very pleased that after a number of years of product development with extensive field tests and in tough competition, deliver these machines to LKAB. Jama has developed a new operator’s seat that makes Jama’s recognized, good working environment even better. 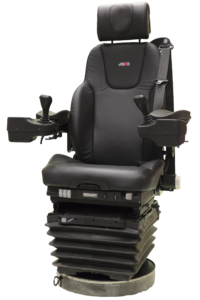 The seat has a new robust under carriage of scissor type that is adapted to the environment in the mine and with adjustments that will allow all drivers to find an optimal driving position. The new seat includes a new design on the joy-stick box with new handles designed according to the latest ergonomic findings. We are convinced that this new driver’s seat will further consolidate our position as a manufacturer that puts the operator at the center. Existing machine park can be upgraded with the new joy-stick solution or with a complete seat. The new TMH 430 is a drill cassette designed to be fitted on Wheel Loaders and is operated by radio control from a safe position outside the machine or from the cabin. TMH 430 addresses users where flexibility is an important part of the work. A standard wheel loader can quickly be transformed into a self-powered drill unit that is intended for service drilling, pallet drilling, drilling of boulders, etc. We are pleased to announce a new product that will attract companies in mining / infrastructure projects as well as in the public sector. At the Katowice Mining Fair, which took place 29/08 – 01/09/2017 in Katowice Poland, we presented our Mobile Rescue Hoist together with our Polish distributor OPA-ROW. 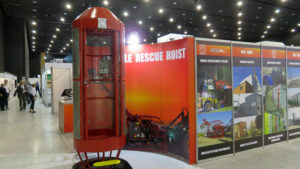 The Rescue Hoist is now also available in a larger version for the Polish market with a lifting height of 1200m. We have delivered a BK008 Mobile Working Platform mounted on a Volvo L70 wheel loader to Europe’s largest zinc mine, Boliden Tara Mines in Ireland. In the last year, we have also delivered another BK008 with the same carrier as well as two Charging Trucks built on Volvo FMX chassis with charging equipment from Orica. Today a CSU8000 shotcrete rig was delivered to our Finish customer Kittilä Mine. Jama has now fulfilled the delivery of the 8000-rigs ordered by Kittila Mine. Jama Mining Machines has received its first export order to Finland for mining rigs in the Jama 8000-series. Europe’s largest gold mine, Agnico Eagle Kittilä Mine in northern Finland has signed an order comprising a Mechanical Scaler and a Shotcrete rig. “We see this as a breakthrough in Finland since the Kittila Mine is regarded as Finland’s most modern mine and is considered as a role model and trendsetter for the country’s other mines,” says Anders Norberg, Business Development Manager and responsible for export sales at Jama Mining Machines.